The Pale Man (1934) is featured in our collection of Halloween Stories. Something is odd about the man in Room 212 . . . I HAVE not yet met the man in No. 212. I do not even know his name. He never patronizes the hotel restaurant, and he does not use the lobby. On the three occasions when we passed each other by, we did not speak, although we nodded in a semi-cordial, noncommittal way. I should like very much to make his acquaintance. It is lonesome in this dreary place. With the exception of the aged lady down the corridor, the only permanent guests are the man in No. 212 and myself. However, I should not complain, for this utter quiet is precisely what the doctor prescribed. I wonder if the man in No. 212, too, has come here for a rest. He is so very pale. Yet I can not believe that he is ill, for his paleness is not of a sickly cast, but rather wholesome in its ivory clarity. His carriage is that of a man enjoying the best of health. He is tall and straight. He walks erectly and with a brisk, athletic stride. His pallor is no doubt congenital, else he would quickly tan under this burning, summer sun. He must have traveled here by auto, for he certainly was not a passenger on the train that brought me, and he checked in only a short time after my arrival. I had briefly rested in my room and was walking down the stairs when I encountered him ascending with his bag. It is odd that our venerable bell-boy did not show him to his room. It is odd, too, that, with so many vacant rooms in the hotel, he should have chosen No. 212 at the extreme rear. The building is a long, narrow affair three stories high. The rooms are all on the east side, as the west wall is flush with a decrepit business building. The corridor is long and drab, and its stiff, bloated paper exudes a musty, unpleasant odor. The feeble electric bulbs that light it shine dimly as from a tomb. Revolted by this corridor, I insisted vigorously upon being given No. 201, which is at the front and blessed with southern exposure. The room clerk, a disagreeable fellow with a Hitler mustache, was very reluctant to let me have it, as it is ordinarily reserved for his more profitable transient trade. I fear my stubborn insistence has made him an enemy. If only I had been as self-assertive thirty years ago! I should now be a full-fledged professor instead of a broken-down assistant. I still smart from the cavalier manner in which the president of the university summarily recommended my vacation. No doubt he acted for my best interests. The people who have dominated my poor life invariably have. Oh, well, the summer's rest will probably do me considerable good. It is pleasant to be away from the university. There is something positively gratifying about the absence of the graduate student face. If only it were not so lonely! I must devise a way of meeting the pale man in No. 212. Perhaps the room clerk can arrange matters. I HAVE been here exactly a week, and if there is a friendly soul in this miserable little town, he has escaped my notice. Although the tradespeople accept my money with flattering eagerness, they studiously avoid even the most casual conversation. I am afraid I can never cultivate their society unless I can arrange to have my ancestors recognized as local residents for the last hundred and fifty years. Despite the coolness of my reception, I have been frequently venturing abroad. In the back of my mind I have cherished hopes that I might encounter the pale man in No. 211. Incidentally, I wonder why he has moved from No. 212. There is certainly little advantage in coming only one room nearer to the front. I noticed the change yesterday when I saw him coming out of his new room. We nodded again, and this time I thought I detected a certain malign satisfaction in his somber, black eyes. He must know that I am eager to make his acquaintance, yet his manner forbids overtures. If he wants to make me go all the way, he can go to the devil. I am not the sort to run after anybody. Indeed, the surly diffidence of the room clerk has been enough to prevent me from questioning him about his mysterious guest. I WONDER where the pale man takes his meals. I have been absenting myself from the hotel restaurant and patronizing the restaurants outside. At each I have ventured inquiries about the man in No. 210. No one at any restaurant remembered his having been there. Perhaps he has entrée into the Brahmin homes of this town. And again, he may have found a boarding-house. I shall have to learn if there be one. The pale man must be difficult to please, for he has again changed his room. I am baffled by his conduct. If he is so desirous of locating himself more conveniently in the hotel, why does he not move to No. 202, which is the nearest available room to the front? Perhaps I can make his inability to locate himself permanently an excuse for starting a conversation. "I see we are closer neighbors now," I might casually say. But that is too banal. I must await a better opportunity. HE HAS done it again! He is now occupying No. 209. I am intrigued by his little game. I waste hours trying to fathom its point. What possible motive could he have? I should think he would get on the hotel people's nerves. I wonder what our combination bellhop-chambermaid thinks of having to prepare four rooms for a single guest. If he were not stone-deaf, I would ask him. At present I feel too exhausted to attempt such an enervating conversation. I am tremendously interested in the pale man's next move. He must either skip a room or remain where he is, for a permanent guest, a very old lady, occupies No. 208. She has not budged-from her room since I have been here, and I imagine that she does not intend to. I wonder what the pale man will do. I await his decision with the nervous excitement of a devotee of the track on the eve of a big race. After all, I have so little diversion. WELL, the mysterious guest was not forced to remain where he was, nor did he have to skip a room. The lady in No. 208 simplified matters by conveniently dying. No one knows the cause of her death, but it is generally attributed to old age. She was buried this morning. I was among the curious few who attended her funeral. 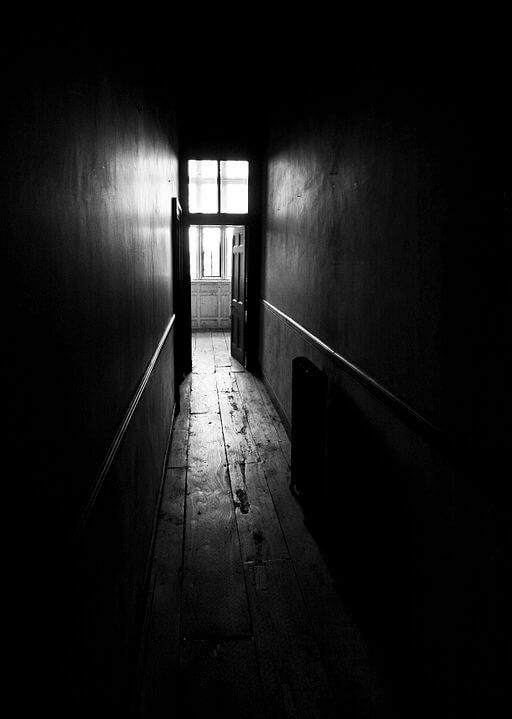 When I returned home from the mortuary, I was in time to see the pale man leaving her room. Already he has moved in. He favored me with a smile whose meaning I have tried in vain to decipher. I can not but believe that he meant it to have some significance. He acted as if there were between us some secret that I failed to appreciate. But, then, perhaps his smile was meaningless after all and only ambiguous by chance, like that of the Mona Lisa. MY MAN of mystery now resides in No. 207, and I am not the least surprized. I would have been astonished if he had not made his scheduled move, I have almost given up trying to understand his eccentric conduct. I do not know a single thing more about him than I knew the day he arrived. I wonder whence he came. There is something indefinably foreign about his manner. I am curious to hear his voice. I like to imagine that he speaks the exotic tongue of some far-away country. If only I could somehow inveigle him into conversation! I wish that I were possessed of the glib assurance of a college boy, who can address himself to the most distinguished celebrity without batting an eye. It is no wonder that I am only an assistant professor. I AM worried. This morning I awoke to find myself lying prone upon the floor. I was fully clothed. I must have fallen exhausted there after I returned to my room last night. I wonder if my condition is more serious than I had suspected. Until now I have been inclined to discount the fears of those who have pulled a long face about me. For the first time I recall the prolonged hand-clasp of the president when he bade me good-bye from the university. Obviously he never expected to see me alive again. Of course I am not that unwell. Nevertheless, I must be more careful. Thank heaven I have no dependents to worry about. I have not even a wife, for I was never willing to exchange the loneliness of a bachelor for the loneliness of a husband. I can say in all sincerity that the prospect of death does not frighten me. Speculation about life beyond the grave has always bored me. Whatever it is, or is not, I'll try to get along. I have been so preoccupied about the sudden turn of my own affairs that I have neglected to make note of a most extraordinary incident. The pale man has done an astounding thing. He has skipped three rooms and moved all the way to No. 203. We are now very close neighbors. We shall meet oftener, and my chances for making his acquaintance are now greater. I HAVE confined myself to my bed during the last few days and have had my food brought to me. I even called a local doctor, whom I suspect to be a quack. He looked me over with professional indifference and told me not to leave my room. For some reason he does not want me to climb stairs. For this bit of information he received a ten-dollar bill which, as I directed him, he fished out of my coat pocket. A pickpocket could not have done it better. He had not been gone long when I was visited by the room clerk. That worthy suggested with a great show of kindly concern that I use the facilities of the local hospital. It was so modern and all that. With more firmness than I have been able to muster in a long time, I gave him to understand that I intended to remain where I am. Frowning sullenly, he stiffly retired. The doctor must have paused long enough downstairs to tell him a pretty story. It is obvious that he is afraid I shall die in his best room. The pale man is up to his old tricks. Last night, when I tottered down the hall, the door of No. 202 was ajar. Without thinking, I looked inside. The pale man sat in a rocking-chair idly smoking a cigarette. He looked up into my eyes and smiled that peculiar, ambiguous smile that has so deeply puzzled me. I moved on down the corridor, not so much mystified as annoyed. The whole mystery of the man's conduct is beginning to irk me. It is all so inane, so utterly lacking in motive. I feel that I shall never meet the pale man. But, at least, I am going to learn his identity. Tomorrow I shall ask for the room clerk and deliberately interrogate him. I KNOW now. I know the identity of the pale man, and I know the meaning of his smile. Early this afternoon I summoned the room clerk to my bedside. "Please tell me," I asked abruptly, "who is the man in No. 202?" The clerk stared wearily and uncomprehendingly. "You must be mistaken. That room is unoccupied." "Oh, but it is," I snapped in irritation. "I myself saw the man there only two nights ago. He is a tall, handsome fellow with dark eyes and hair. He is unusually pale. He checked in the day that I arrived." The hotel man regarded me dubiously, as if I were trying to impose upon him. "But I assure you there is no such person in the house. As for his checking in when you did, you were the only guest we registered that day." "What? Why, I've seen him twenty times! First he had No. 212 at the end of the corridor. Then he kept moving toward the front. Now he's next door in No. 202." The room clerk threw up his hands. "You're crazy!" he exclaimed, and I saw that he meant what he said. I shut up at once and dismissed him. After he had gone, I heard him rattling the knob of the pale man's door. There is no doubt that he believes the room to be empty. Thus it is that I can now understand the events of the past few weeks. I now comprehend the significance of the death in No. 207. I even feel partly responsible for the old lady's passing. After all, I brought the pale man with me. But it was not I who fixed his path. Why he chose to approach me room after room through the length of this dreary hotel, why his path crossed the threshold of the woman in No. 207, those mysteries I can not explain. I suppose I should have guessed his identity when he skipped the three rooms the night I fell unconscious upon the floor. In a single night of triumph he advanced until he was almost to my door. He will be coming by and by to inhabit this room, his ultimate goal. When he comes, I shall at least be able to return his smile of grim recognition. Meanwhile, I have only to wait beyond my bolted door. Add The Pale Man to your own personal library.